Trending in Arrests - Stop for no headlights leads to Heroin, Methamphetamine, and more. Each week, we will post an arrest of interest pointing toward arrest and crime trends within Arcadia. Drug arrests are not uncommon and this past week saw a batch of different events involving possession or under the influence of drug arrests. One event of interest involved a group of four persons who were driving in West Arcadia Tuesday morning at 3:00 am with no headlights on. An officer stopped the van they were in for vehicle code violations and contacted all four subjects. Two of the subjects were in the rear of the van behind a cage, one lying on the floor and another seated in a folding chair. Ultimately, all four subjects were removed from the van and during the officers' investigation, a quantity of heroin, methamphetamine, and marijuana was found during a search. Other items such as a scale, syringe, and currency was also found. Jason M. Giannini, 27-year-old male from Tujunga, Sevan Asatoorian, 33-year-old male from Glendale, and Juan C. Fuentes Jr, 27-year-old male from Tujunga, were all arrested and booked on felony charges at the Arcadia City Jail. 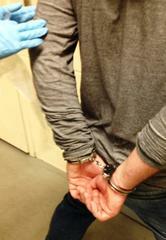 Mark S. Zaba, 28-year-old male from Tujunga was also arrested on a misdemeanor charge. Booking photos were not available at time of posting. Anyone with information on this case or other cases is encouraged to contact the Arcadia Police Department at 626-574-5156. Or, if you wish to remain Anonymous, call “LA Crime Stoppers” by dialing 800-222-TIPS (8477), use your smartphone by downloading the “P3 Tips” mobile app on Google play or the App Store, or by using the website http://lacrimestoppers.org.